The New York State AMBER Alert plan is activated when an investigating law enforcement agency has reasonable cause to believe that an abduction of a child (under the age of 18) has occurred and the child is believed to be in danger of serious bodily harm or death, either due to the actions of another or due to a proven mental or physical condition. When a missing child under the age of 21 or a college student of any age is deemed to be endangered, but the case does not meet AMBER Alert activation criteria, there are two alternative alert systems available, known as the Missing Child and College Student Alert Programs. A missing child or college student can be at serious risk of bodily harm or death without an abduction occurring. For example, children with Down syndrome, autism or other medical conditions can be at an extreme safety risk if they go missing. 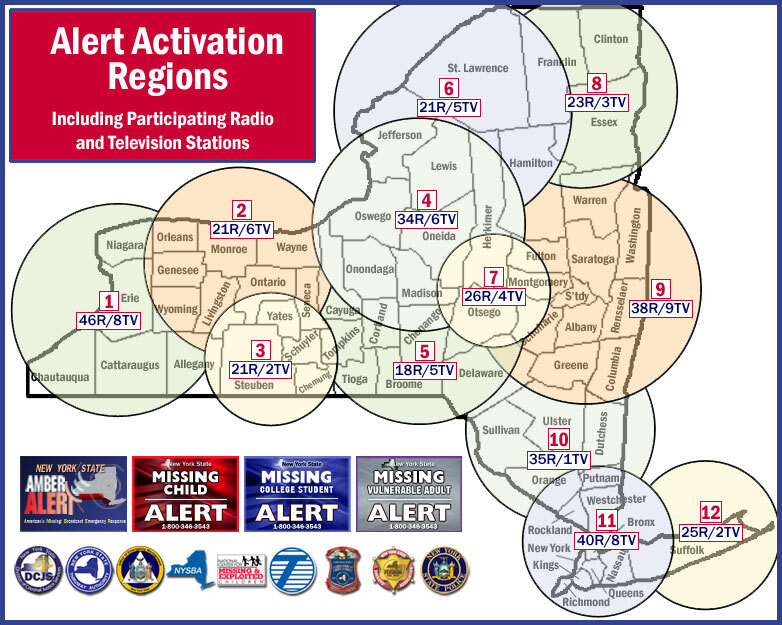 When a Missing Child or College Student Alert is activated, information about the missing child or college student is distributed electronically throughout New York State to every police agency, television and radio stations and newspapers, New York State Thruway travel plazas/toll barriers, airports, bus terminals, train stations, border crossings, Alert subscribers and others within minutes. Information is also posted to the DCJS website and National Center for Missing and Exploited Children (NCMEC) website. Visit www.nyalert.gov for more information or to register to receive Alerts. Unlike an AMBER Alert, radio and television station managers decide if – and when – to broadcast Missing Child or Missing College Student Alert information and Lottery terminal displays are not activated. While the maximum length of time for an AMBER Alert is eight hours, a Missing Child or College Student Alert can remain active for up to 72 hours. With both alerts, highway signs are active for up to eight hours. Requests for a Missing Child or Missing College Student Alert must be made by the police agency investigating a disappearance by contacting the Missing Persons Clearinghouse (MPC) at 1-800-346-3543. Also, requests are sent to the MPC by the New York State Police whenever an AMBER Alert request has been declined. MPC handles all responsibilities, including selection of activation regions and electronic dissemination of posters. 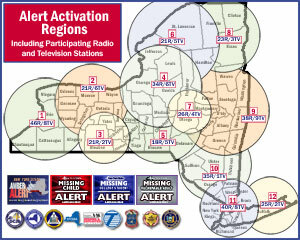 Missing Child, Missing College Student Alert and AMBER Alert activation regions are identical. Note Alert details and be observant. Immediately call police with any information that may help to locate the child/college student. Provide specific details such as: the exact location and time of the sighting; descriptions of the child(ren), accomplice(s) and automobile(s); and direction of travel. Do not take action which could endanger your safety or escalate danger to the missing person.